Some days, I run my diffuser overtime, and I'm sure others do the same. Learn how to clean your essential oil diffuser so it will last for years to come! Some days, I run my essential oil diffuser overtime, and I’m sure others do the same. Diffusing oils on a regular basis has kept our family healthy and in a good mood for the last couple of years. After a few days of continuous use, I see a faint yellow or brown stain forming. 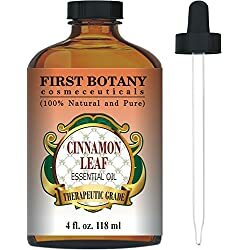 Or, if I’m using cinnamon oil (one of my favorites!!! ), I’ll see a stain after only a few hours of use. Keeping your essential oil diffuser clean is important to its longevity, and since it’s easy to clean, make a habit of doing it at least once a week, and more often if you diffuse oils that stain, or diffuse for long hours. So, let’s talk about how to properly clean your diffuser. If your diffuser came with cleaning instructions, please follow those. Otherwise, feel free to pick your favorite method below. Make sure you unplug your diffuser before cleaning! What would we do without vinegar? It has so many great uses, one of them being to clean your diffuser. All you need is water and vinegar, a soft cloth and a Q-tip. Mix equal parts of water and vinegar, pour the mixture in the diffuser and leave it there for a couple hours, or even overnight, if possible. Then dump out the liquid, and gently dry with your soft cloth, and finally, use the Q-tip for clean the metal ring at the bottom of your difffuser. Some people put a few drops of vinegar just like they would an essential oil and diffuse the vinegar for a few minutes. Another method of cleaning those hard working essential oil diffusers is to use alcohol: some people just use a soaked Q-tip, while others mix the water and alcohol and let it stand for a few minutes before cleaning. No matter which method you use, if you clean your diffuser weekly, it will last a lot longer and work a lot better. Trust me: it’s easier to care for your trusty working diffuser than buy a new one when it breaks, or be without one. Don’t have a diffuser? Here are 29 ideas about how to diffuse essential oils without a diffuser!